The Australian music industry celebrated the success of this year’s most outstanding Australian contemporary classical music achievements at the 2007 Classical Music Awards. The Awards were presented by APRA and the Australian Music Centre, at the Sydney Theatre, Walsh Bay. 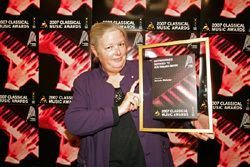 Music entrepreneur, Belinda Webster (pictured) was the recipient of the prestigious award for Distinguished Services to Australian Music. Roger Smalley picked up the prestigious Best Composition by an Australian Composer award for his string orchestral work, Birthday Tango. The work was commissioned by Barbara Blackman to celebrate the Australian Chamber Orchestra's 30th birthday. Percussionist, Rebecca Lagos collected the Best Performance of an Australian Composition award for her performance of Nigel Westlake's When The Clock Strikes Me, performed with the Sydney Symphony conducted by Richard Gill and commissioned by Symphony Australia. The Outstanding Contribution by an Organisation award went to the 2006 Aurora Festival of New Music - an inspiring cultural event staged in Western Sydney, which included music by more than 34 Australian and international composers with concerts, presentations and forums, an academic conference and national broadcasts. Percussionist Claire Edwardes collected the Outstanding Contribution by an Individual award for her sustained commitment to Australian composition. Inspirational artistic director and one of Australia's best-known percussionists, Ian Cleworth was acknowledged for his lifetime of distinguished achievement and commitment to Australian music when he accepted the Long-Term Contribution to the Advancement of Australian Music award. The winners for the three prestigious Work of the Year awards (choral/vocal, orchestral, instrumental) were Sarah Hopkins, for her work May You Dance, recounting the tragic events in Childers in 2000; Liza, Lim for Flying Banner (After Wang To); and Ross Edwards for Piano Trio. Rebecca Lagos (soloist) for her performance of When The Clock Strikes Me by Nigel Westlake with the Sydney Symphony. A special thank you to ABC Radio National's program The Music Show for providing the transcript of Andrew Ford's interview with Belinda, which was used in the Distinguished Service Award audio-visual presentation. The inspiring and dedicated artistic director and performer, Ian Cleworth, for his superb long-term contribution to Australian music. Tristram Cary for his long-term contribution to Australian music. Tristram’s outstanding career as an innovator in electronic music, composer and educator, has profoundly influenced the development of electronic music in Britain, Australia and the USA. He has received numerous awards for his outstanding contributions, including the prestigious Prix Italia. Holland 's Utrecht String Quartet performing Gordon Kerry Variations for String quartet for Musica Viva Australia tour in Melbourne. Queensland Youth Symphony performing Carl Vine’s Symphony No. 2. The QYO set itself a difficult challenge in choosing to perform this work, however the final performance was hailed as ‘amazing’ by the composer himself and was impressed by the incredible care taken with the music. Iain Grandage for his composition The Silence written for the West Australian Symphony Orchestra. The work explores the theme of the loss of the parent, with brilliant use of musical quotations and parody; it captivated its intended young audience from beginning to end. David Malone for his individual contribution though the Fretsongs CD Project. David has made an outstanding contribution in bringing to life the works of six composers for the classical guitar. The CD is adventurous in its programming, confidently presented and serves Tasmania well by showcasing the creativity in the State. The collaboration bewteen guitarist and composer was an essential element of the project which has made a significant contribution to the repertoire for the instrument and has already encouraged the performance of these works elsewhere.